I’m a sucker for a simple dress. Some of my very favorites end up being the most basic design style, and I appreciate being able to work through a project in an hour or two. 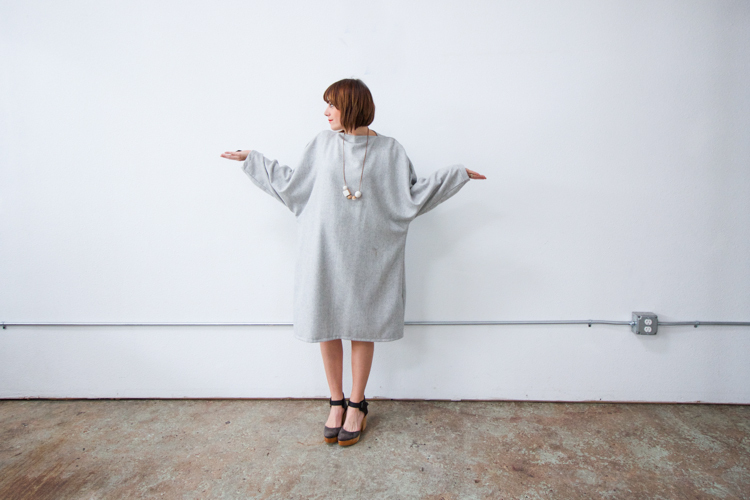 When I needed a grey dress for a winter wedding, I had the idea to create a lightweight wool dolman dress with long sleeves and an asymmetrical hemline. You can see the silhouette is really simple. I literally laid myself down on the fabric and traced around my body shape to get the basic outline! The neckline is a simple, flattering boatneck and the whole thing came together in four seams and three hems. Let me show you how to make one for yourself! To create your simple pattern, you can use a couple pieces of poster board taped together, or a roll of butcher paper. I used chalk and traced directly onto my fabric, but I don’t necessarily recommend that method–I tend to be a little reckless. Lay down with the center line of your body on the edge of the paper and the top of your neck at the upper edge. Put your arm out at a 45 degree angle towards the other edge of the page. Have a friend or family member trace around your body outline. 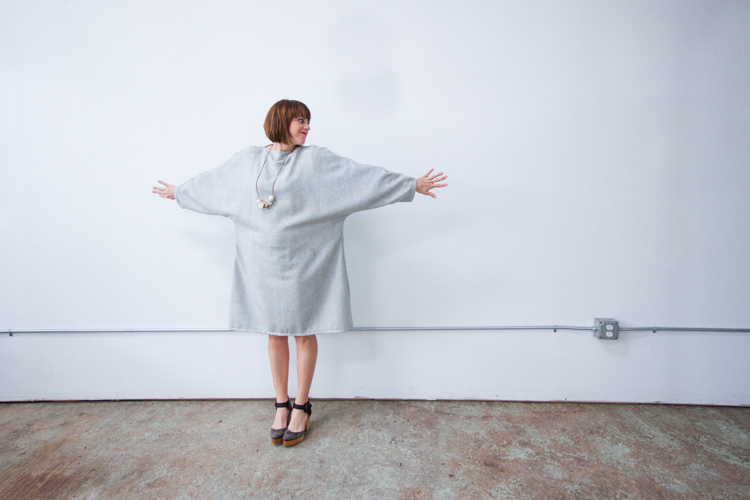 Using the body outline as a basic guide, create a second line about 1″ from the shoulder line and wrist, then curving inward toward the hip for the dolman sleeve, and staying 2-3″ away from the side and hip line. 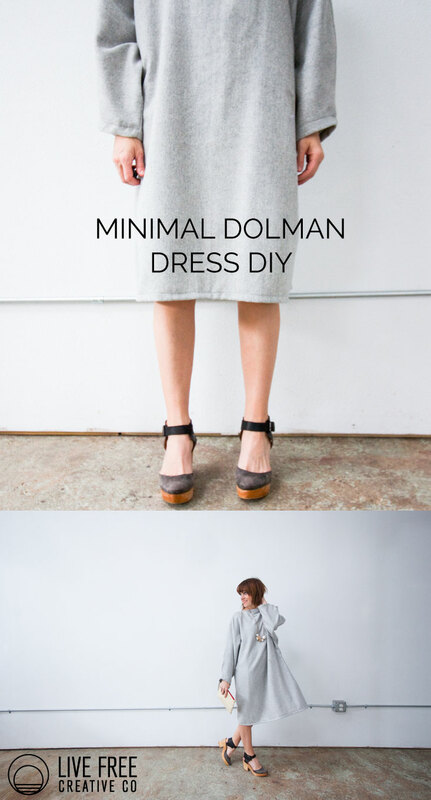 Finish by creating a straight hemline 1″ below where you’d like the dress to hit, leaving space for a 1/2″ hem. 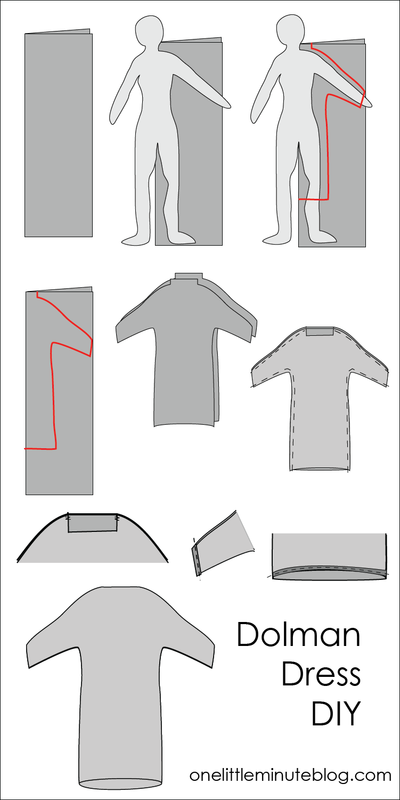 Create the neckline flap by drawing a straight line up, about 2″ from the traced neck line, as shown. Take a look at your pattern and adjust if anything looks super wonky. If anything, error on the side of creating a pattern a little bit larger than you might need, because you can always cut it down a little more if needed. Cut your pattern out and trace or pin it to your fabric, on the fold. Cut two. 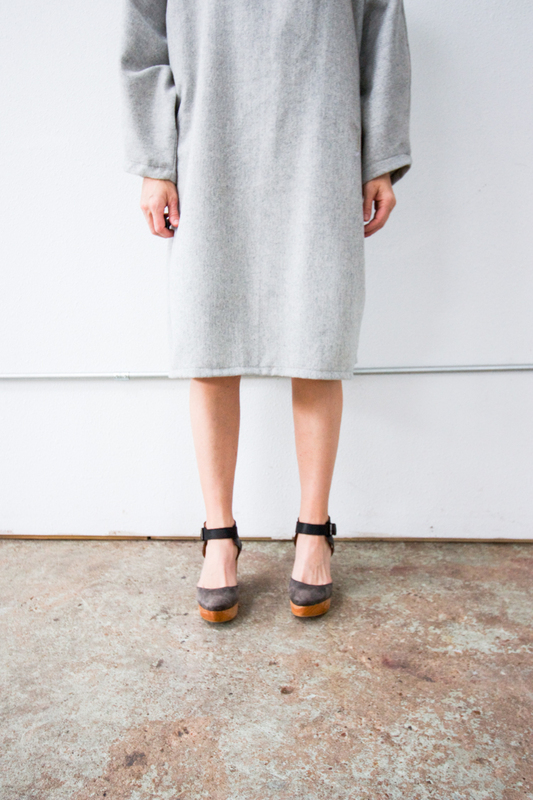 If you’re creating an asymmetrical hemline, you can cut the curve after the side seams are sewn. Optional: Serge around the edges of the neckline of each pattern piece so that when it’s sewn the edges are all finished. If you don’t have a serger, you can use a zig-zag stitch, or fray stop. Fold the neck flap down on either side, towards the wrong side of the fabric, then with right sides together stitch along the shoulder lines. Stitch from the wrist around the inside towards the hem as well. At this point try on your dress and see how it fits. It is supposed to be boxy and draped. If you need to take it in somewhere, stitch along a new line, then if it works cut off the excess fabric. When you’re ready, finish the seams with a serger or zig-sag stitch. Tack the edges of the boatneck with a couple stitches to keep the flaps in place. Turn the wrist hems inside 1/4″ then 1/2″ and stitch in place. Optional: If you want an asymmetrical hemline, line up the side seams of the fabric and cut a gentle curve from the back to the front of the hem. Adjust as necessary to your liking. Turn the hem under 1/4″ then 1/2″ and stitch in place. Turn the dress right side out, iron and enjoy! 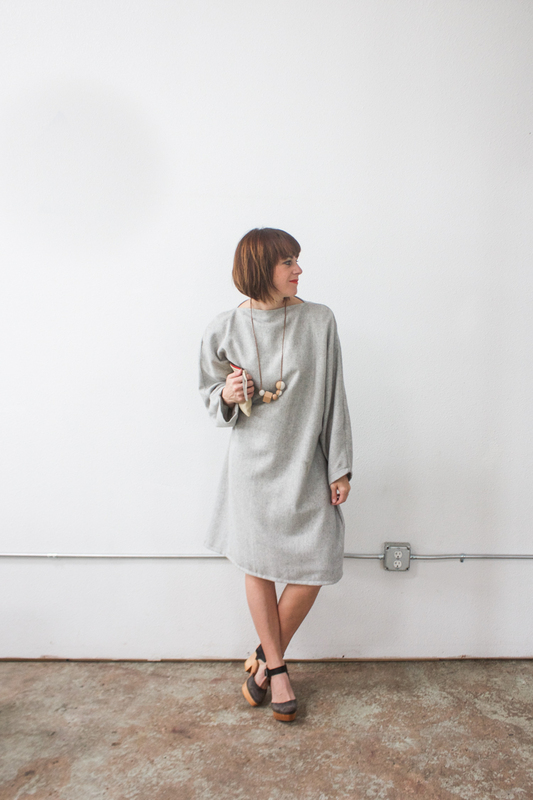 When you pair it with your favorite shoes and necklace, you’ll never want to take your new dolman dress off! Two other favorite simple dresses I’ve made over the years are the Texas Summer Drawstring-Waist Box Dress, and this old favorite Chevron Front Summer Dress. They both have full tutorials for you to follow as well, so get sewing! 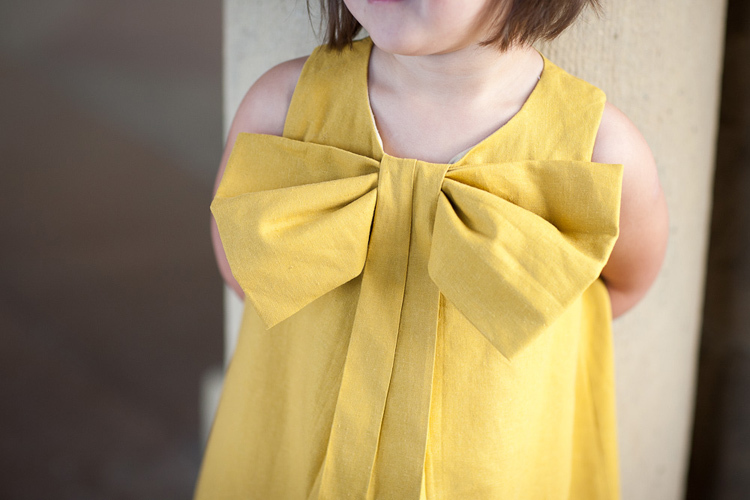 February is Love of Sewing Month over at Babylock, and I’m thrilled to be including this Dolman Dress DIY in their daily free sewing tutorials this month. I have been sewing on my Babylock machines for a few years now and I love them both!